Today is going to be a designing day for me. I like to gather my thoughts and ideas in my design journal. It is really helpful to get lots of designing in so come the Winter months the stitching out put is high. Also some stitching on the banner for Pretty Nostalgic magazine!!!.... I do some each day. It has taken over my dinning room with all its vintage loveliness! For the last few weeks of Summer I am gathering ideas, with so much lovely weather I am able to go beach combing or walking by the river or into the forest. Then when I am stitching for summer when it is cooler I have all the images I need to make a sampler or picture or indeed something for a wedding or nursery. This summer has produced some amazing lavender in my garden and with all the butterfly and bee friendly plants has brought in some amazing butterfly's. I have also being using all types of different bird seed to attract different species and I have to say it is working. I would like to do some beach combing when I go to America, one of places we will be visiting is Cape Cod and the beaches there are stunning..... 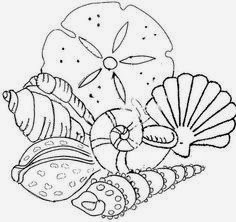 I would like to find some sand dollars! Stitching away and practising things is a great way to improve. I have been playing with shells in embroidery and feel that some of the shells I have stitched are really great Having ordered some more of the hand dyed threads from the Shaker collection, I am pleased to be bringing one back called sea shell...... I hope that it will enhance my designs with its hand dyed variegated hues. Well I am away to the garden, have a wonderful day and Happy Stitching!